While rice makes a perfect “sponge” for the flavorful tomato-based sauce of the easy slow cooker chicken tikka masala I shared last week (click here for that recipe), I often serve it over a bed of roasted cauliflower instead. If you like this idea, the following recipe is a perfect companion; simply skip the blue cheese and rosemary. For serving alongside basic baked chicken or grilled steak, the addition of blue cheese, which becomes gooey and delicious after a brief broil, makes an especially worthy side dish. I think the key to great tasting roasted vegetables of any kind is to place the cut sides down on a well-oiled pan and roast at a high heat without turning. 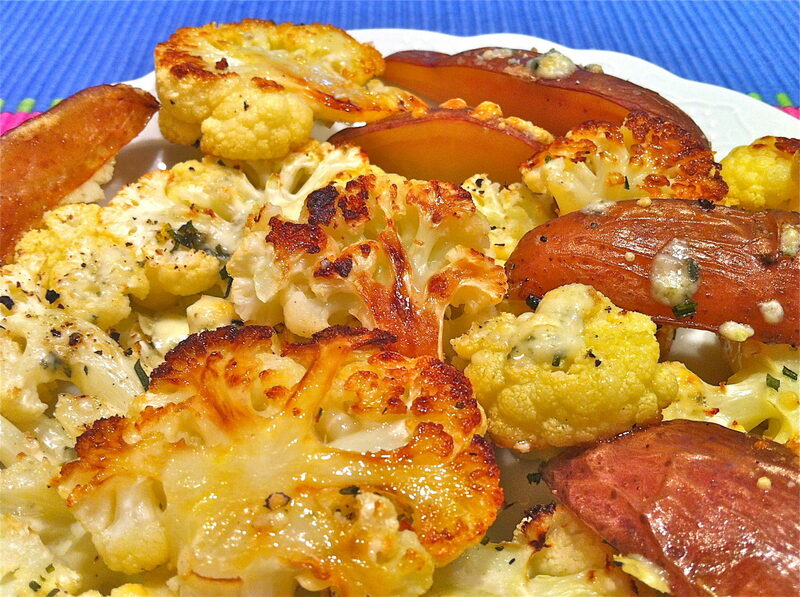 This way, the hot surface of the baking sheet caramelizes the bottoms of the veggies while keeping them crisp-tender. I hit upon the following method of cutting the cauliflower when in a hurry one night. In addition to being quick, the flat sides allow for maximum contact with the surface of the baking sheet and, therefore, more of the golden brown crustiness that tastes so good. You may certainly cut into florets instead. Cut the cauliflower crosswise (from top to bottom) into 1/2-3/4-inch thick slices, removing and discarding the leaves and stem. Cut the potatoes into 1/2-inch thick wedges. Lay the vegetables on a very well oiled baking sheet in a single layer, arranging so that the flat, cut sides are touching the pan. When just cooked, remove vegetables from the oven, and switch to the broil setting. Sprinkle with the blue cheese and broil, watching very closely, for 1-2 minutes or until the cheese is melted and the tops of the veggies are golden brown. When substituting dry for fresh herbs, I typically use 1/3 the amount of dry as I would use fresh. Fresh rosemary is one of the more pungent herbs, but I think it loses some of its potency when dried. So, in this recipe I use a similar amount, whether fresh or dry. I discovered the joy of eating roasted cauliflower a couple of weeks ago when I tried a roasted cauliflower and gouda recipe. I’ll have to put this recipe on the menu next week! I bet is was delicious with Gouda, Janette. Perhaps I will have to try that next! The recipe was so easy. It was so good, I’ve fixed 3 times in the past 3 weeks. 🙂 I tried it at the local grocery store’s kitchen. Sprinkle 1 cup of freshly grated gouda-it called for smoked gouda but I used regular gouda. bake for another 5-10 minutes. I think the next time I may try adding some new potatoes and use rosemary instead of the oregano and basil. I love it when that happens, Kathy! I am attaching a link for my favorite simple way to roast butternut squash and hope that may be helpful. If you use the feta, it will not melt like the blue cheese does but the flavor pairs very well with the squash. I also have a recipe for spinach and ricotta stuffed roasted butternut squash for something altogether different yet not complicated to prepare. Hope you enjoy! Hi Ann! I have missed checking in on your blog.. 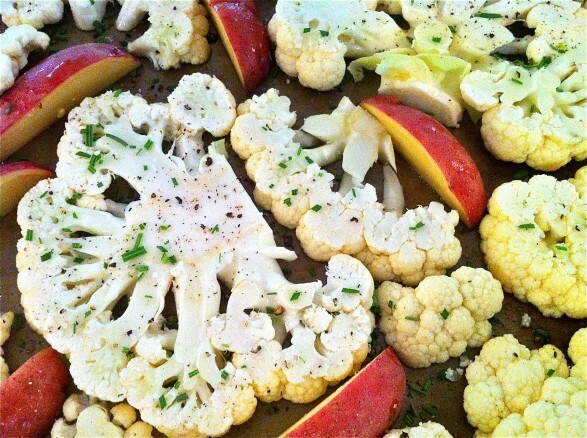 This looks wonderful and I think my husband might even eat cauliflower prepared like this! And of course blue cheese is fabulous on anything.. I need to do better keeping up with with your recipes.. I’m back to work and crazy busy, but I need my Fountain Ave Kitchen fix! Tried these tonight. Delicious! Thank you for the idea. We used the blue, red and white fingerlings–beautiful and tasty! So glad you liked, Genevieve, and I love how you used the colorful fingerlings! Thanks for the great idea! I am making this tonight for dinner along with some green beans, not sure how I will prepare them yet. I need an all veggie meal and this will be perfect! I hope you enjoy…the green beans will make it a colorful and delicious plate! It was terrific! Green beans and this was perfect dinner and very filling. Outstanding recipe! I added roasted sweet potatoes and cut up shallots and threw in some green beans for the last 10 minutes. Anointed with Gorgonzola and broiled as directed WOW. Served with pan fried bavette…the crispy green beans, sweet potato and crunchy caramelized cauliflower too delicious! Thank you very much, Allison! I am thrilled you enjoyed this recipe and your additions sound absolutely delicious. I am getting hungry and I just ate breakfast! Thank you very much, Evelyn! This recipe is hearty and satisfying so would be a great option for a vegetarian. I hope your daughter enjoys it. I do have some other great vegetarian recipes that she might enjoy as well. And thank you for the reminder about Janette’s recipe. I really have to get some Gouda! I just roasted some cauliflower last night with olive oil and kosher salt. It was excellent. Wish I would have seen your blog. Wasn’t sure what I was doing. I’ll add some cheese today when I warm it up for supper. Thanks for sharing.